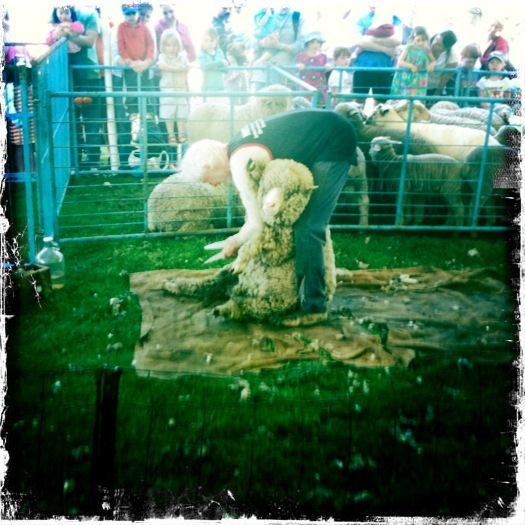 This past weekend, back in Boston obviously, was the Massachusetts Sheepshearing Festival out in Waltham at Gore Place. Similar to the recent Woolapalooza event there were sheepshearing demonstrations of both the electic and old-school variety. There were also sheep — everywhere! Look how cute that little guy is after he got his haircut! 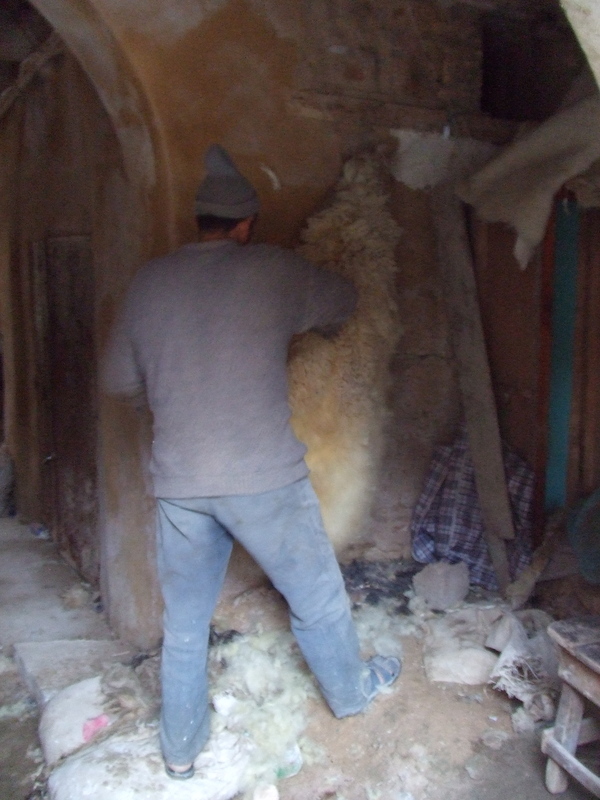 It’s interesting because some people I’ve met in the yurt process don’t know that sheepshearing in fact doesn’t hurt the sheep — they are just getting their hair shorn off and given the timing of the shearings it’s pretty in keeping with them needing to cool off in the summer time. 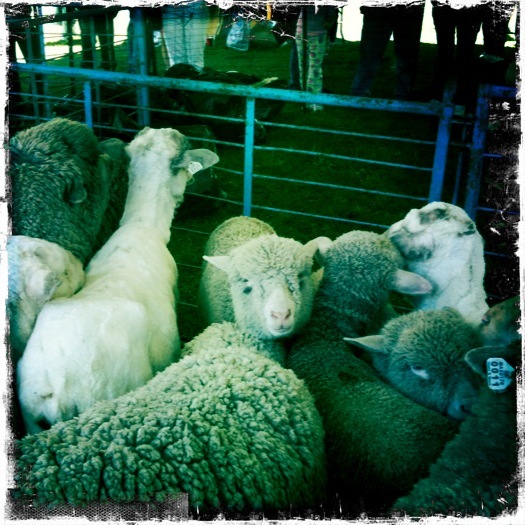 The gray ones are pre-shearing and the white ones are post-shearing and, look, they’re all okay! 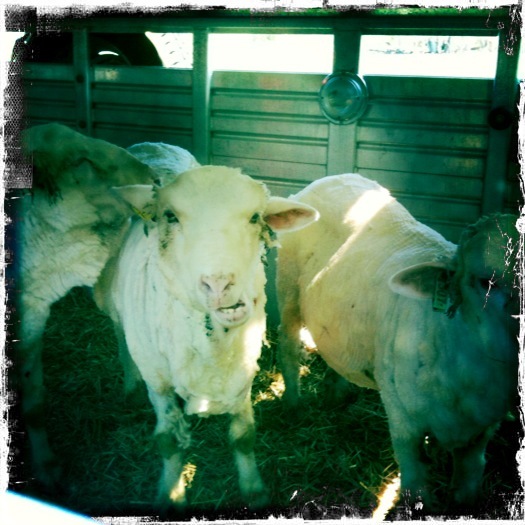 As some of you will notice this is the same sheep shearer as was at Woolapalooza — he is awesome. He works so fast but is very delicate with the sheep and very calm, they don’t resist whatsoever, I think they kind of like it. 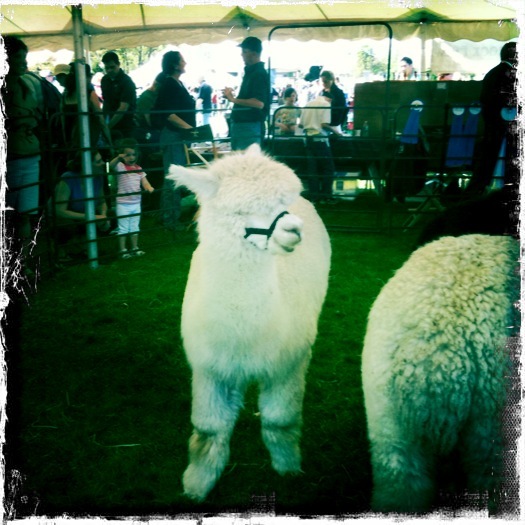 There were also Alpacas, baby goats, little lambs, etc. It was a very animal-centric day! 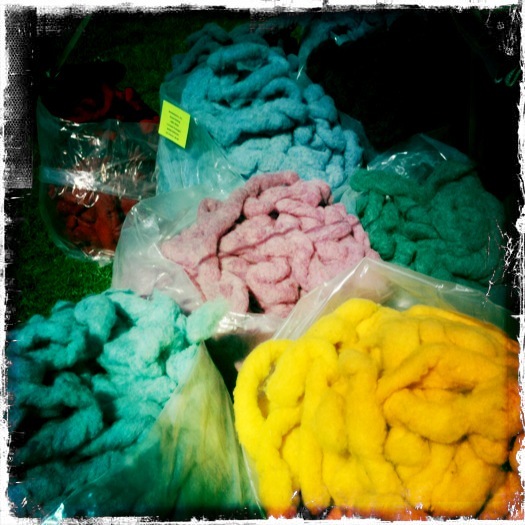 And look at all that beautiful roving! It was all I could do to not steal it…though with those colors I’m sure I would have been caught. We also saw a neat sheepherding demonstration but I think the puppies were tired by the time we got to them! Overall the whole day was great, it was gorgeous out here in Boston and it was great to spend a day with my mom and dad again! My dad even bought me, for my upcoming birthday, a “piggie bank” that is actually a “sheepie bank” — it’s so cute! When I left for Morocco I knew that I’d be meeting with the weavers in Midelt that Nest works with on product design and development but I never really stopped to think where their wool came from until we got there. 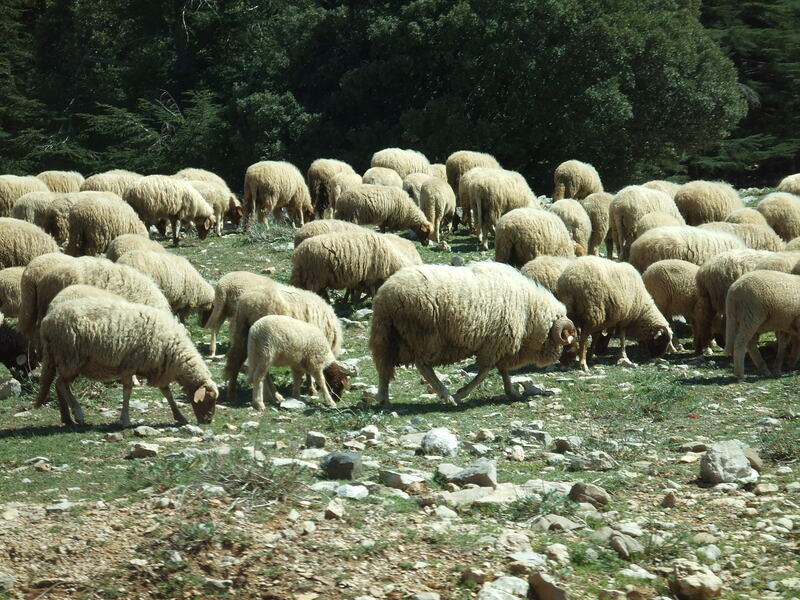 It turns out that Hayat and her cooperative don’t own their own sheep but get their wool from a nearby town, clean it themselves in basins and then weave it. 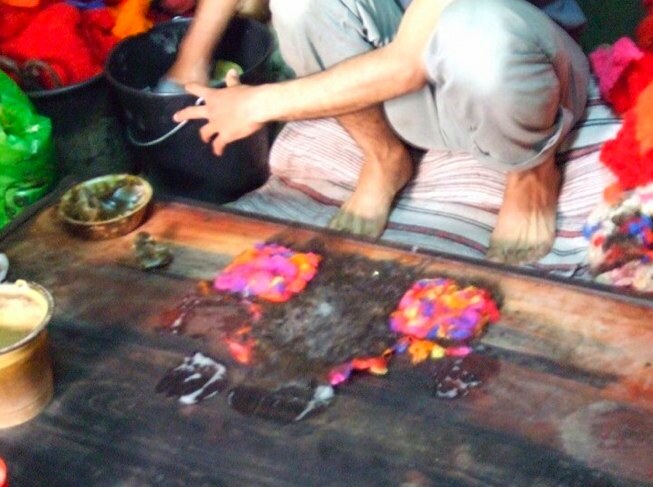 Despite this…we saw a lot of sheep action and wool techniques on our trip! 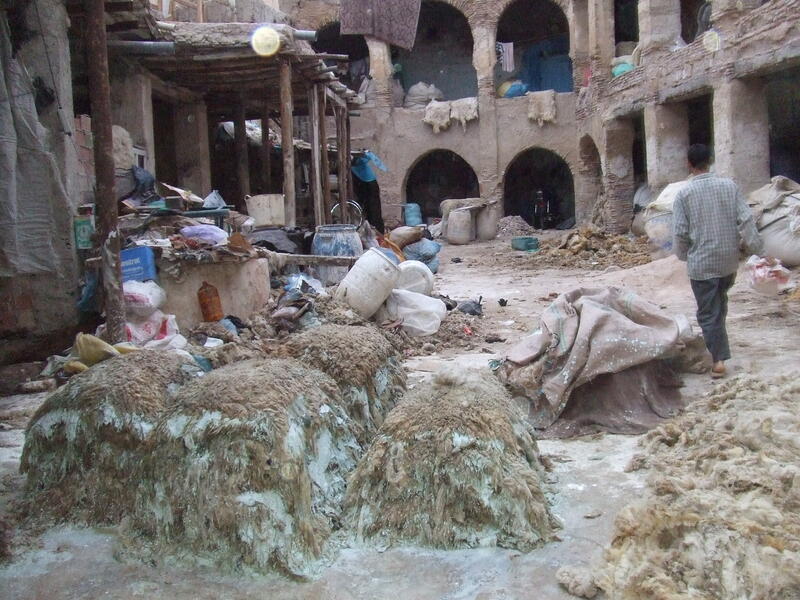 In Fes we saw this place where they were skirting wool and getting it ready for weaving. 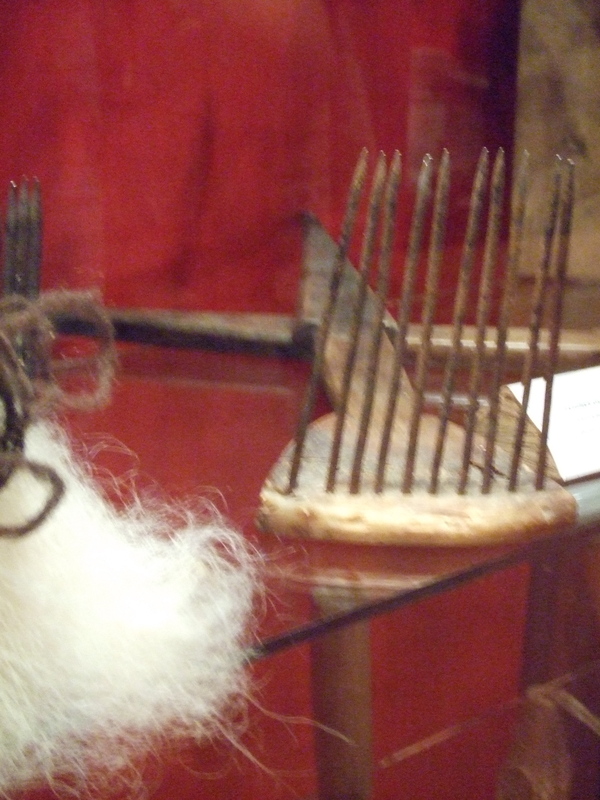 Unlike how I skirt, they just had an oversized hand rake and went after it — much more efficient! I think I’m going to make myself one of these little handtools. They seem awesome! 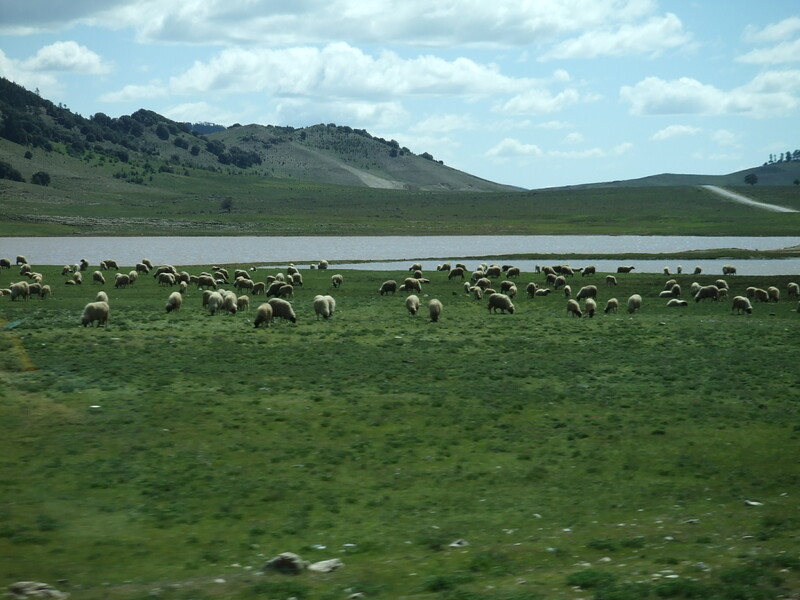 We saw sheep along every road we drove — which was a lot of road. Sometimes they were crossing, sometimes they were just hanging by the side but everyone had a shepherd and sometimes, they’d bring a lamb and put it in our bus. 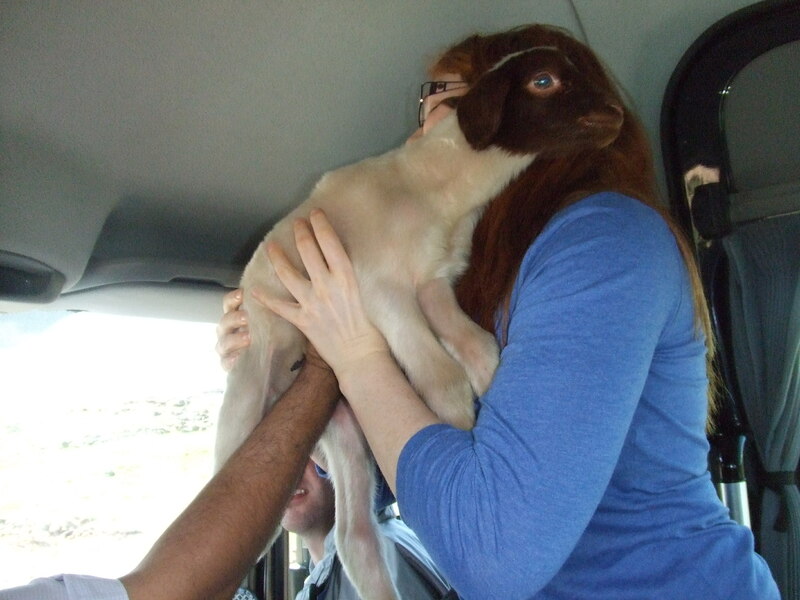 That’s my friend Penni, holding a little lamb when we stopped by the side of the road — totally normal. The sheep had wonderful places to live — each region’s climate and topography was so different it was great to drive from place to place and see as much as possible though Tim claimed we needed another six weeks to see it all! I’m back from Morocco and had the most amazing trip! I traveled around with 14 women from Nest and two Peace Corp Volunteers, Brian and Tim and just fell in love with the country. Everyone was unbelievably nice, I felt super safe, we saw amazing things, we danced, laughed, cried, ate, drank…it was epic! One of the highlights for me though was meeting this amazing little felter in Marrakech! This man wet felts indoors, crouched up like that, making hats, slippers, necklaces, handbags, etc. He spoke amazing English and was happy to discuss technique. I asked him if he ever used bubble wrap to felt but he said he preferred to agitate the wool just with his fingers but that a bunch of French women had asked him the same thing! 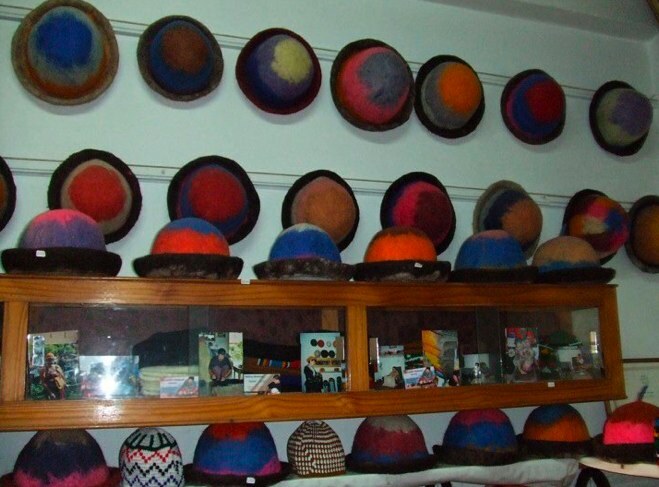 He had a small shop filled mostly with 100s of hats! They came in all colors, some had spiney things coming out of them, they were wonderful. Had it not been 85 degrees out I might have bought one! 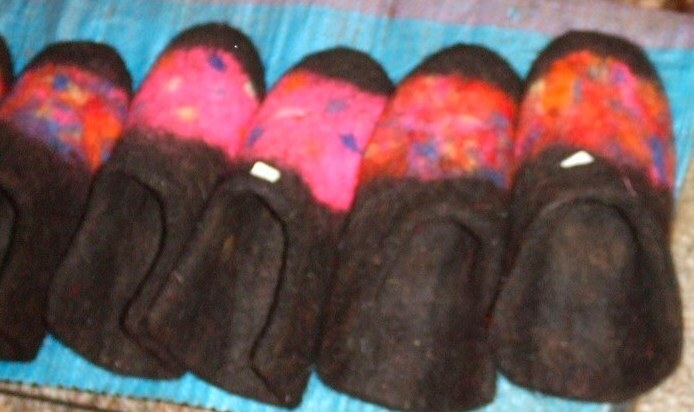 The day I visited he was making slippers. They were thick and looked a bit like Converse with the backs cut off. They were mostly brown with some color built in and it looked like he had a great system for cranking them out! Now I need him to come to NH and help me with the yurt! Look how cute they are! And you feet just slide right in. I ended up buying a necklace for my mom that was big felt beads with embroidered patterns on the outside — I will be replicating that at home soon too. I told him about the yurt. I’m not sure he believed me…but I’m used to that reaction by now. This was his little sign above his store in the local Artisana. While he wasn’t directly a part of the craft fair that our loan recipients were involved with while we were there I’m sure he got some great business from all the foot traffic. He was so sweet, I could have felted with him all day! Now, just wait for all the sheep pictures! Yurt lovers, I’m taking a vacation! 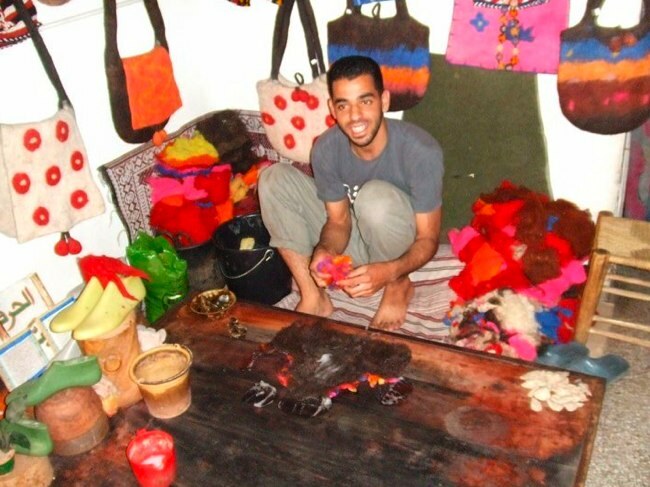 This crochet-aholic will be spending the next 10 days in Morocco visiting with local artisans who are the beneficiaries of Build a Nest’s micro-loans. I have a feeling I’ll get a lot of mini yurts made on my 14 hours of flying in the next few days and I also have a feeling I’ll be returning with many more craft materials than anyone could imagine. 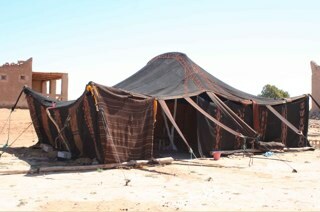 While the above is not a yurt Morocco also has a nomadic heritage and I’m sure I’ll be seeing some pretty cool transportable dwellings in the desert and in the mountains — we’ll be all over! On the rewards front I’m happy to report that over 45 packages have done out — with more to ship when I’m home! Some people are even blogging about receiving them, which warms my heart! If you haven’t gotten yours yet, keep your eyes peeled!